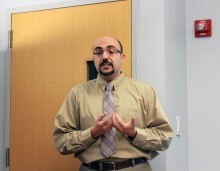 On May 6, 2016, the NYU Jordan Center for the Advanced Study of Russia welcomed Evgeny Finkel, Assistant Professor of Political Science and International Affairs at George Washington University, for a lecture titled “Tocqueville Warning: Reform and Rebellion in Imperial Russia.” During the event Finkel presented the findings of a joint project with Scott Gehlbach, Professor of Political Science at the University of Wisconsin-Madison, devoted to the seeming contradiction between reforms as a preservation mechanism for autocracies and the unrest that such reforms create in weak states. Finkel started his lecture by presenting the ideas of French political thinker Alexis de Tocqueville in connection with government and revolution. “The regime destroyed by a revolution is almost always better than the one that immediately preceded it and experience teaches us that the most hazardous moment for a bad government is normally when it is beginning to reform,” Finkel said quoting Tocqueville. The speaker noted that the potentially negative impact of reforms on social stability has been overlooked by recent scholarship, which makes his work with Gehlbach particularly important. The two applied their methods as political scientists in order to analyze the efficacy of reform in preventing rebellion among the population. Finkel presented the case of the emancipation of Russian serfs in 1861 as an example of how a reform intended to prevent social unrest can fail to deliver stability. While freeing the serfs was for Alexander II aimed to preempt pressure from below, the reforms were actually followed by large spike in unrest among the peasant population. Far from a unanimous vote, the emancipation law was a compromise between conflicting views within a divided elite, and as such, it fueled grievances among the population at large. After providing an overview of the various archival sources he and Gehlbach relied on to collect the data, Finkel proceeded to outline their empirical strategy. In shedding light on the dynamics of unrest among the population following the 1861 reform, the two political scientists analyzed cases of theft, violence and official complaints – all instances when the population refused to comply with the new order. Finkel and Gehlbach also distinguished peasants according to categories (landowner serfs, state and court peasants) and considered geographical location and different time dimensions. One of the most interesting findings in their analysis is that cases of social uprising were considerably higher among the peasants who had been directly affected by the emancipation—namely, the landowner serfs. In looking at the reasons for the unrest, Finkel revealed that the transitory period of adjustment to the new law was marked by a significant increase in disturbances directly related to the liberation process. The speaker drew a correlation between such episodes and the faults inherent the reform, both in terms of design and implementation. The requirement that freed peasants pay for the land, as well as the limited state capacity in organizing an effective apparatus to enforce the new order, caused systemic inequities yet again to the detriment of the peasant population and in favor of the nobility. This was also evident in the context of the zemstvo structures introduced following the emancipation. The zemstvo, local assemblies intended to provide the subjects of the empire with a degree of self-governance, were in fact designed to prevent the peasants from dominating. Finkel suggested that this arrangement was a direct consequence of the social unrest that was already becoming pervasive across the country. The analysis of Finkel and Gehlbach (who worked together on the project with Steven Nafziger, an Associate Professor of Economics at Williams College and Paul Dower, an Assistant Professor of Economics at Florida International University) also attempts to tackle a possible correlation between unrest and lower peasant representation in the zemstvos. In the final part of his presentation, Finkel outlined what he and Gehlbach intend to be the second part of their project: an analysis of the social situation in Russia in 1905 and the correlation between violence and the Constitutional Reform. Highlighting the differences between the 1861 and 1905 scenarios, he pitted against each other the decentralized and divided government under Alexander II and the higher degree of centralization which followed the Revolution of 1905. Even though the speaker pointed out how the availability of reliable data for the period in question might represent a challenge to a more exhaustive analysis, he also emphasized that violence decreased following the implementation of reforms. These observations, Finkel concluded, were the reasons for revisiting Tocqueville’s words on the correlation between reform and social unrest. According to Finkel, such correlation becomes true most significantly when the ruling elites are divided and the state capacity to enforce the proposed changes is low. In the ensuing Q&A session, Kathryn David, a PhD student at New York University, asked whether Finkel’s model could also be applied to reforms targeting the elites themselves. Rossen Djagalov, Assistant Professor in the university’s department of Russian and Slavic Studies, inquired about the way the two political scientists define reform in their study. Other questions tackled the model and categories employed as well as the use of Russian Imperial Statistics in the study.